Can I Legally Keep a Gun in My Car in Florida? We all know the Second Amendment to the U.S. Constitution guarantees Americans the right to own weapons. However, that freedom is not without restriction, and it’s important to understand how state law may restrict your rights. It’s common in Fort Lauderdale, Miami and West Palm Beach for gun owners to keep their firearms in the vehicle. You should know that keeping your firearm in your vehicle is as legal as keeping it in your house – so long as it isn’t concealed. Per F.S. 790.001, a concealed firearm is any that is carried “on or about a person in such a manner that it is hidden from ordinary sight of another person. What that means in terms of your vehicle is that you can have your gun on your passenger seat or blatantly uncovered on the floorboard. That is considered legal. Not committed for alcohol or drug abuse. There are some exceptions, though. For example, if you were previously been convicted of drug offenses, but desire a gun for self defense or demonstrate firearm competence (i.e., complete NRA training or law enforcement safety training), you may still be able to obtain a concealed carry license. Open carry is a different issue. F.S. 790.053 details the Florida legislature’s stance on open carry of weapons. The law says except as otherwise provided under the law, it’s unlawful for any person to openly carry on or about his person any firearm or electric weapon or device. If you have a concealed carry license and you briefly and openly display the gun to the ordinary sight of another, that’s not against the law – unless you did so in the context of anger or in a threatening manner that wasn’t necessary for self-defense. This provision doesn’t prohibit open carry of self-defense chemical sprays or non-lethal dart-firing or stun guns. If you unlawfully possess a concealed firearm in Florida, it’s considered a third-degree felony, punishable by up to five years in prison. 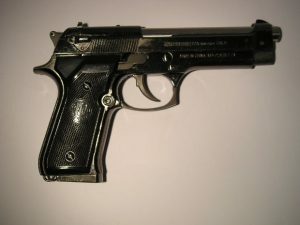 In order to secure a conviction, prosecutors must show the firearm was readily accessible, meaning it was not only being carried, but was positioned in a way that it was readily accessible to be retrieved and used quickly. If you are stopped and you have a weapon in the car, you must remain calm. You need to keep your hands on the wheel and politely, calmly inform the officer there is a firearm in the vehicle and note its location. The officer might at this point instinctively pull out their own weapon. It’s important you continue to remain calm, hands on the steering wheel or dash and follow the officer’s instructions. This is true even when you are legally carrying a weapon. We can worry about defending your case later, but you need to make it out of that traffic stop uninjured. If you are arrested on weapons-related offenses in Florida, we can help.